How to watch MKV on Android device? 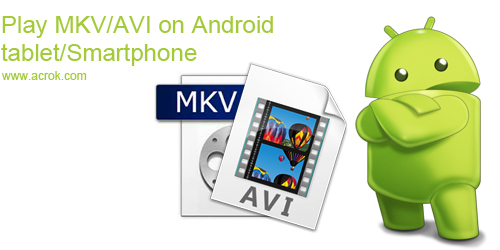 MKV on Android: Want to Play downloaded MKV movies on Android devices? Here is a free step by step guide to help you convert MKV to Android smartphone or tablets playable format via top Android Converter. "Just want some advice on how long it should take to convert a MKV movie to mp4 for my Galaxy Note 5. At moment its takes like 9 hours to convert a 115 minutes movie from .mkv to .mp4 format using one free video converting software. Is this right or am I doing something wrong. Please help. Thanks." Answer: Encoding speed is related to many factors, like your CPU processing speed, hard disk writing speed, Disc Drive reading speed, etc. I used Acrok Android Video Converter to convert video to Note Pro tablet compatible .mp4 file because it offers perfect Note Pro preset profile and this format shrinks a 100min movie into around 1GB and still keeps good quality and aspect ratio. I just received my new Sony Xperia Z4 tablet yesterday, and it is really amazing for playing games and watching HD movies. But I have some video playback problems when I transfer downloaded movies to Xperia Z4 tablet. I had many MKV movies on my computer and want to play them on my brand new Xperia tablet, tried many ways but still no luck, is there an easy solution to solve this problem and help me out? Answer: MKV, common HD and SD video format, is famous for multiple subtitles and audio tracks, and due to its complexity, it is not well supported by lots of Android devices, and there isn't an all-in-one player that are able to play all your MKV videos. So it is really a headache. For people who fail to play 1080p or 720p MKV movies on Android devices, Acrok MKV Video Converter is the way to go. It will easily convert MKV (as well as other Android device incompatible formats like MOV, WMV, MTS, FLV, F4V, MXF, RMVB, Tivo, etc.) movies to H.264 .mp4 format to get them play on Android without any problem. "I recently purchased a LG G4, and there is a problem for me to watch my HD MKV movies. The smartphone always tells me that the video formats are not supported. What can I do with it? Unable to watch MKV movies on LG G3 really upsets me a lot, I need a solution." Answer: Well, don't be upset, it's a common problem for nowadays digital products. Only you need to do is to convert your MKV files into MP4 format, the friendly format for LG G4. How to do so? Good question! Here I think MKV to Android Converter is the best choice for you. With it, you can reformat all video files to the target format you want, and edit your videos as well, like to trim, crop, split, and merge, which enables you to make your own films. MKV - MKV is a flexible, open standard video file format that has quickly become the preferred file extension for high definition video on the Internet. 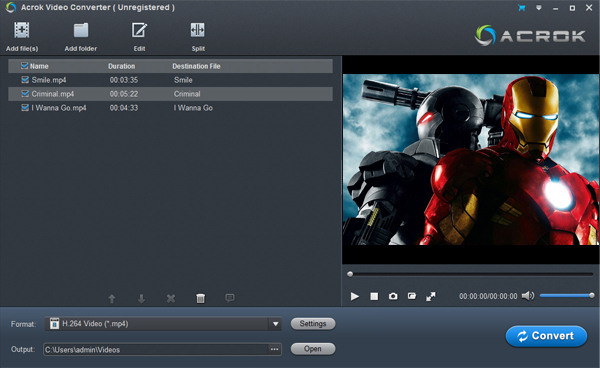 The MKV container can include video, audio, and features such as alternate audio tracks, multilingual subtitles and chapter points, as well as rich metadata including cover art, ratings, descriptions and more. The best way to play MKV movies on Android is to change MKV to Android compatible formats like MP4. To achieve it, you can use Android Video Converter to convert MKV format to Android friendly MP4 and then transfer then converted MP4 files to your Android tablet or smartphone. If you downloaded some AVI movies and want to play these movies on Android devices, this Android Video Converter cah help you convert AVI to Android tablet abd snartphone best playback format. Just download it and follow the steps to put MKV videos on Android Tablets and Phones. Step 1. Click "Add video" to load the SD or HD MKV videos to the program. If you have multiple MKV files, this Video Converter for Android supports batch conversion. Tip: If you want to personalize your MKV videos, you can clip or edit them: clip videos to get the wanted segments, crop the black bars and adjust video effects. Step 2. Click "Format" option and choose MP4 under Common Video category, Android or your Android device model as the output video format. If you like, you can choose a output format in Android category. Step 3. Click the "Converter" button to begin converting your MKV videos for playback on any Android mobile/tablet. Tip: Apart from MKV, this Android Video Conversion program can also convert videos in other popular formats like WMV, FLV, AVI, VOB, MTS, MPEG, RMVB, TS, MPG, M4V, MP4 and more to Android supported video formats quickly while retaining the original video quality. If you are editing software user, and you likeing editing and making movies by youeself. You can convert any video to Mac and Windows editing software editable codec. 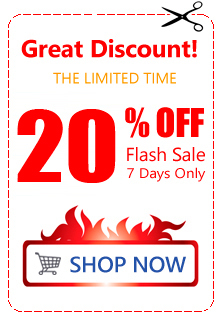 Let you edit any video in FCP, Premiere, Vegas, Avid, FCE, iMovie, Movie Maker, etc., freely. Though Android devices don't support MKV playback natively, you can still play MKV on Android without converting the MKV files. There are many free media players for Android in the market and most of them are free. Popular Android video players include BSPlayer FREE, Dice Player and MX Video Player. With a smart player installed on your Android device, you can play MKV movies without conversion on your Android device. Note that though there are so many video players for Android, many of them can't play HD 720p or 1080P MKV videos in high quality on your device. What's more, some apps will slow download your device. So it's still recommended that you convert the videos on your computer and then transfer the converted videos to Android devices for playback on the go.